Im not sure if this has happened to anyone else. I'm using Rift with Optifine and voxelmap. Without Rift, the window panes are fine, but with Rift, they look almost solid and orange in colour. No idea what does this or how to fix it. I've not tried Rift with Optifine yet for both 1.13. & 1.13.2, and not noticed the Rift 1.13.2 issues you speak of, is it when their in the world or in the creative menu or something, just to ask out of curiosity, but I'll try myself and see what happens. Otherwise I don't know who's issue it could be, if either Optifine's or Rift's. 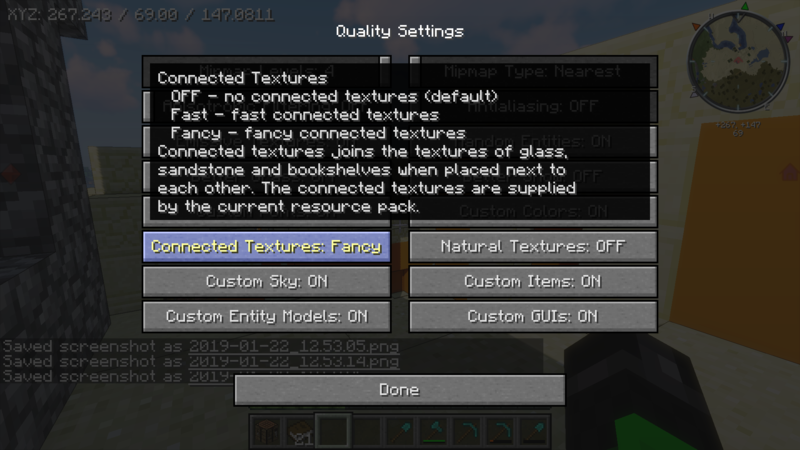 I think it might be Optifine's since I never use it anymore and assume Rift would get things right without interfering with Vanilla's side of things like with connected textures or so which I assume might the case. Either way, assumptions aside, I'll give an Rift 1.13.0 & 1.13.2 with Optifine instance setup a go and see what happens.I'll respond back with my findings after this post. After remembering hating getting Optifine and remembering the ad redirect days but getting the mirror direct link yes but lose care to support creators that do this for me to jump hoops to get a file. I downloaded it, remembered I had to extract Optifine over using the profile of Optifine install method to get it working for working with Rift or Forge and I'm good to go. I've now succeeded in my Profiling and setup and running the game. Now, which glass panes are you taking about exactly? The clear ones? The stained orange ones? I assume you mean the clear ones acting odd with the orange right? I just want to be sure. 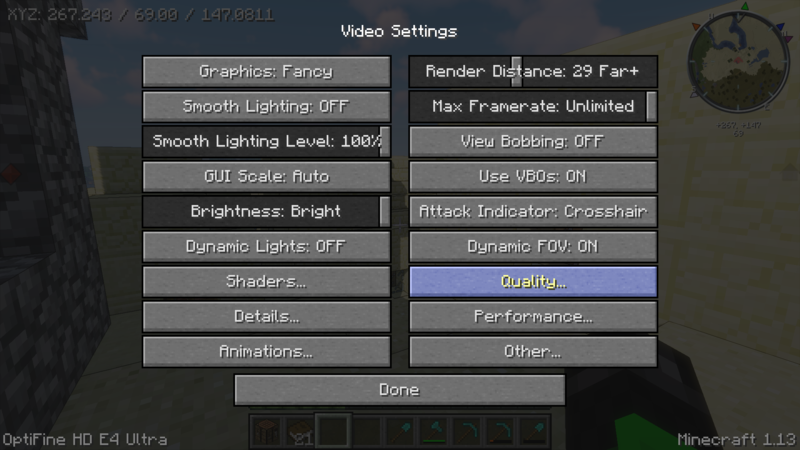 And an Optifine settings comparison would also be good so that if its one settings acting up I can narrow it down to that and properly come to a conclusion of what Optifine might be doing over Rift since not had issues with Rift like that or the mods like Voxel Map for 1.13.0 or 1.13.2 even with my brief time with 1.13.2 so far. I am also seeing this issue with Rift 1.13.2+OptiFine_1.13.2_HD_U_E4 and my glass turning orange. You are not alone. Which glass, clear, stained, is it displaying it when on a particular camera angle even? Since I can't tell which in mine, can someone tell me the settings they have for Optifine so I can replicate this even more closely if it is Optifine it could be 1 setting or a group of that makes this happen. Apparently, it's all the glass that is stained, including the glass panes. Interesting, I'd have to take a look myself a bit more then once I change the settings and see what happens after a bit more testing, not come across that when I loaded up my world but those screenshots do show it is a glaringly noticeable display there. How much time in the world have you played so far, and or did you create a 1.13.2 world before adding Rift or Optifine at all. Maybe that might be the case from changing things over. I don't know for sure, I can only guess on possibilities right now. I'll see how I do in my own time but can't right now, otherwise not sure who to inform it to for now unless maybe the Mod Creators (Aquarius or Voxel Map since they have the Rift 1.13.2 mod links and might get in contact with the Rift 1.13.2 Maintainer maybe?, or the Optifine creator maybe, Optifine and Rift have been mentioned to have conflicts for 1.13 I think but I've never used it together for 1.13, only testing for this 1.13.2 instance so I can't confirm from my lack of experiences, only what I've heard) could relay the information to the Rift 1.13.2 maintainers? I have no clue honestly, did you also have VoxelMap installed with Optifine or only Rift 1.13.2 & Optifine with these screenshots here compared to what you posted in the first post? I assume yes, but just making sure. And thanks for the Optifine settings, I'll repeat them for myself and see if I get the same before I post again or edit it. I've set the settings to those in the screenshots for Optifine, I've placed a few more glass blocks and panes down. I created the window setup you have for your building there to see if the lighting or something display wise could be easier to replicate. I did get with a yellow glass pane in a sort of darker version but not in the way of the orange textures have it tough to tell the glass outlining, it seemed like a brief lighting bug since I fixed it after a block update/breaking or adding on to the structure. Is it the resource pack maybe? Either it can't understand the textures, or optifine or Rift can't work along side it? Is it 1.13 or 1.13.2 ready? I assume you would have picked one that is, just narrowing down the options is all. Also a question I'd like to ask is, have you tried and noticed it with unconnected glass blocks/panes, is it only when the textures are connected? Maybe that might be a display bug of sorts, but either way I'm guessing it could be the resource pack. That's my new theory anyways, I'm sort of thinking up options at this point since I can't seem to get it working. I'll test some more and see what I find but no luck yet really. If you could tell me the resource pack I can see if it happens for me with that installed. It looks familiar but I'm not sure if I'm thinking of the right one or not which is more so why I'm asking. I have done a bit of messing around with settings and I have found that when connected textures setting is set to off the glass panes and sandstone blocks that are effected by them are fine. 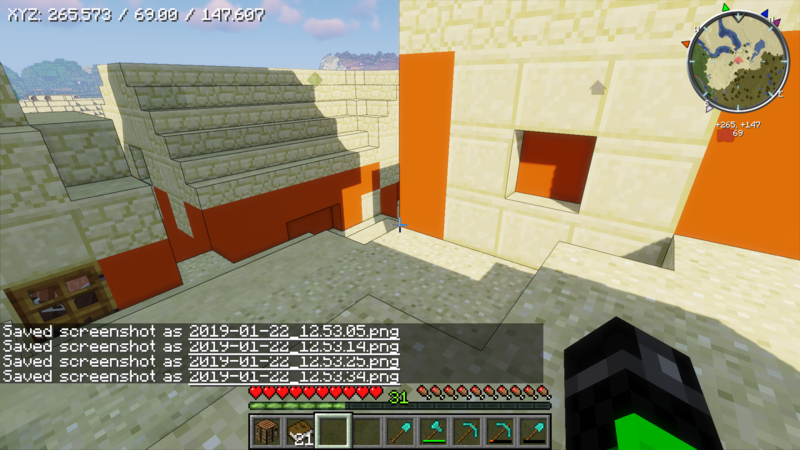 However, when the connected textures setting is set to fancy or fast these blocks look orange and pulsate. I am unaware of what the effect comes from but I assume it is Optifine. I tested this in 1.13 with Rift and Optifine. Well that explains it. But 1.13 you say. Hmm. I'll have to try that (Optifine for 1.13 as a mod.jar wants to misbehave though). Might be the lighting/details of the textures maybe? I don't 100% know what I'm talking about of course, but I'm predicting at least. 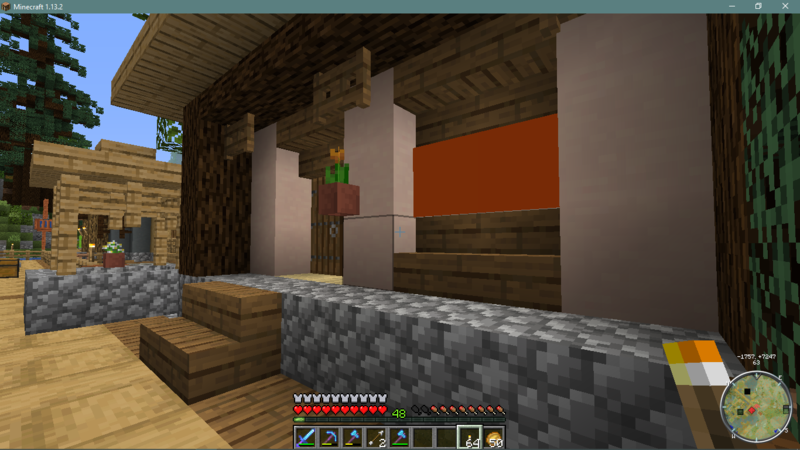 I can confirm that turning Connected Textures OFF in optifine E5 DOES solve the orange glass issue.